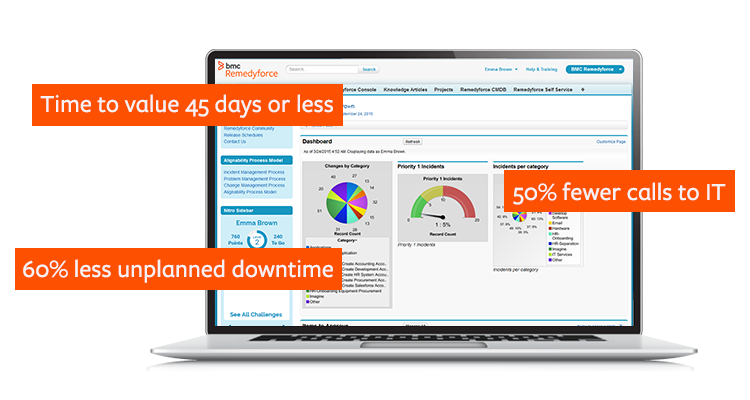 Remedyforce is very well suited when you plan to use the suite of modules including Incidents, Problems, Change, and more. If you are looking to simply have a help desk tool, there may be other options at comparable prices. Automatic Ticket Routing and Escalation Routing Processes. This eliminates a lot of the guess work of who supports what. With changes to organizational structure and team names, the automated workflows will allow tickets to still get routed to the correct group of individuals via self service requests. Linking multiple incidents for the same issue to one problem. Helps manage outages and follow ups. BMC is very open to product recommendations for future releases. It evaluates new features and ideas from its customers and forum users regularly and really drives better functionality with each release. The ability to monitor/regulate the volume of tickets when you integrate with your monitoring software. We have so many items that trigger alerts, creating a ticket for each is somewhat overwhelming. Would like to be able to better control when an incident should be created. Being able to report on Service requests and tasks together would be nice. Right now I have to do it separately as they are in different buckets, so to speak. Remedy console is an improvement from where it started but can still be a cleaner interface for a tech to be able to work out of for their day to day work. I am not the decision maker on renewal of RemedyForce .. what I would say is on renewal I would really try to force the vendor to address the lack of multi-incident closure. They care about your success. Learning industry best practices or gaining insight on them from either BMC or an implementation partner would have saved some headaches we faced after roll-out. Remedy had proven unstable inside Mincom and the other proprietary solution KBox had proven to be rigid ... so RemedyForce was better at uptime and having global access than our previous solutions. I think the positive impact is that it has forced our global business to consolidate on one ticketing solution. The two major development/management sites are Atlanta and Brisbane, Australia and by standardizing the monitoring integration with the back end being RemedyForce we have like cut down on the overall cost of maintaining duplicate in-house ticketing solutions.